Steve Huff’s snook and tarpon collection contains many tried-and-true patterns and a successful recent experiment — solid white flies. One might not go so far as to say Steve Huff wrote the book on fly fishing the flats of the Florida Keys, but he certainly belongs in each of its chapters. He’s guided since the 1960s, led anglers to dozens of world records, and proved that permit could in fact be caught on fies. If you polled every Keys captain today about the guides they admire most, Steve’s name would be on the top of the list. 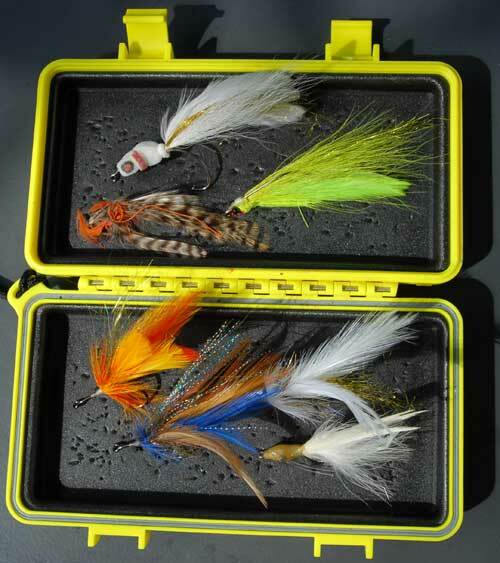 What’s most notable about Steve’s box may be what it does not contain — small flies, which says as much about Steve’s tactics as it does his pattern preferences. “THESE FLIES ARE ALL for tarpon and snook, except for the fly my son Chad tied with the feathers backwards (lower left, top) when he was 3 and the John Emery bonefish fly (lower right) — I keep those with me all the time for good luck. The two flies in the top of the box are my favorite snook patterns. I’d rather catch big snook than anything else right now. I’ve only caught a few snook over 20 pounds on fly — maybe 10 or 12 — but there’s nothing like it. The white fly is my floating fly, which I tie with a gurgler-foam strip that I slide over the hook shank then split and tie back over the body to create the gill slits. I tie this fly, like most of my others, on a Mustad 3/0 jig hook. White’s also my favorite color for snook, if I have to fish only one. The fish won’t always bite a floating fly, but it’s a lot of fun when they do. It’s also a great ‘prospecting’ fly. White’s been my favorite color for tarpon flies lately in clear water. Solid white, nothing else except for the gold tinsel, which I use in almost all my flies for snook and tarpon. My tarpon flies are big — 3/0 and 4/0 hooks and 3 1/2 to 4 inches long — which is partly because I don’t believe small flies are necessary. It makes a difference that I fish for tarpon that don’t usually see other fishermen. On the other hand I took some solid white flies out to the Islamorada ocean side last season and they gobbled them up. The orange fly is something of a tribute to Stu Apte I guess. The blue and light-brown pattern is probably my other go-to fly. I fish it first in turbid or tannin-stained water. As for fishing these flies, I never tie flies on with anything but a loop — I have a special loop of my own that I tie — because it improves fly action. The exception is that I will tie straight to the hook eye in some special circumstances for tailing bones. And I never use fluorocarbon, because it pulls the fly down too fast. And I’ve never noticed that it makes a difference to the fish.